A journey to Bella Coola Valley British Columbia is to be cherished. Only 1 hour north of Vancouver BC by airplane, or an adventure holiday on BC Ferries, Bella Coola Valley and Tweedsmuir Park offer pristine forests, undiscovered landscapes, wilderness grizzly bear viewing, wildlife, remote trails and more... and you will likely want to stay longer than expected. What better way to explore this untapped region of Canada than with a knowledgeable guide from Bella Coola Valley, experienced in outdoor pursuits and ready to show you something out of the ordinary on your wilderness holiday with Kynoch Adventures. Kynoch Adventures has partnered with Bella Coola Mountain Lodge, offering a variety of tours, including bear watching, eco rafting, hiking and interpretive tours for our guests and visitors throughout the Great Bear Rain Forest & Tweedsmuir Park. Visit Bella Coola BC to see it all! Book your 2019 Grizzly Bear Viewing Tours ! From rivers and inlets, to alpine lakes; the Great Bear Rain Forest it all. Grizzly Bear Viewing is Kynoch Adventures Specialty. With more than 3 decades in the fields of biology and tourism guiding, lead guides at Kynoch Adventures are the most knowledgeable and professional wilderness and ecological interpretive guides in the Bella Coola Valley. Kynoch Adventures holds the highest industry and professional standards in grizzly bear viewing and river rafting of any operator in Bella Coola and works closely with BC Parks and other administrations to ensure our tours and adventures are ethical and ecologically sound. Guides are long time local residents, with a sound knowledgte of the area and deep respect for its ecology and social importance. Kynoch Adventures is also pleased to be partnered with Bella Coola Mountain Lodge located right beside us in Hagensborg BC to offer hospitality and accommodations to visiting guests. Kynoch Adventures formerly owned Bella Coola Mountain Lodge, and works directly with their staff to provide tours for guests on a daily basis. Whether on a bear watching holiday, eco rafting adventure, hiking or on an adventure running camp in the alpine or on valley trails, accommodations are close at hand. Bella Coola Mountain Lodge and Kynoch Adventures share adjoining facilities at out headquarters at 1896/1900 Highway 20 making the Lodge the obvious place for guests to stay during their adventure holiday in Bella Coola. Kynoch Adventures follows and exceeds guidelines established by the Commercial Bear Viewing Association of BC (CBVA) and supports the BC Conservation Foundation WildSafeBC program in Bella Coola; two of the most prominent advocacy groups for promoting sustainable bear-human interaction, and we encourage guests to consider these sustainable choices we have made when choosing their holiday arrangements! Bear watching has ecological and social responsibilities attached to it as a wilderness activity. Kynoch Adventures takes these responsibilities very seriously and we are happy to share our enthusiasm with guests on our tours! Both species of bears, grizzly bears and black bears are common in Bella Coola Valley. However, grizzly bears are more commonly seen than black bears on our river guided bear watching tours as grizzly bears are the dominant species and black bears tend to give the grizzlies the right of way on the river, particularly when grizzly bear cubs are involved. 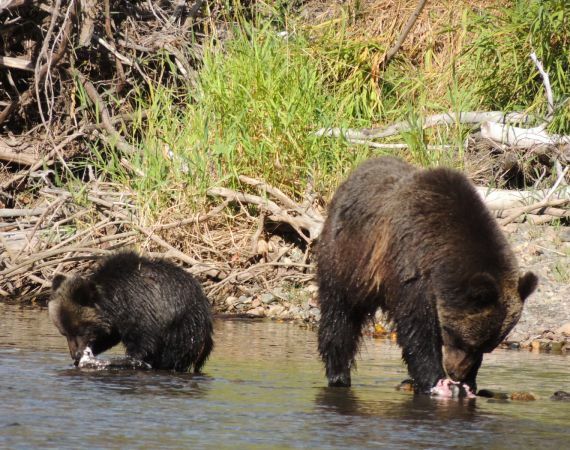 Bear Watching tours in Bella Coola often see bear cubs on the river feeding with the sow bears on Pacific Salmon. Protection of the salmon run to ensure adequate returns for bears to feed on is of significant importance and guides at Kynoch Adventures explain these ecological interactions on bear tours and ecological outings.